An international team of scientists, including astronomers from the Universities of Leicester, Bath and Warwick, have found evidence for the existence of a 'hot cocoon' of material enveloping a relativistic jet escaping a dying star. This research is been published online today and in print in Nature tomorrow. A relativistic jet is a very powerful phenomena which involves plasma jets shooting out of black holes at close to the speed of light, and can extend across millions of light years. Observations of supernova SN2017iuk taken shortly after its onset showed it expanding rapidly, at one third of the speed of light. This is the fastest supernova expansion measured to date. Monitoring of the outflow over many weeks revealed a clear difference between the initial chemical composition and that at later times. Taken together, these are indicators of the presence of the much theorised hot cocoon, filling a gap in our knowledge of how a jet of material escaping a star interacts with the stellar envelope around it and providing a potential link between two previously distinct classes of supernovae. The supernova signals the final demise of a massive star, in which the stellar core collapses and the outer layers are violently blown off. SN2017iuk belongs to a class of extreme supernovae, sometimes called hypernovae or GRB-SNe, that accompany a yet more dramatic event known as a gamma-ray burst (GRB). At stellar death, a highly relativistic, narrow beam of material can be ejected from the poles of the star which glows brightly first in gamma radiation and then across the entire electromagnetic spectrum and is known as a GRB. 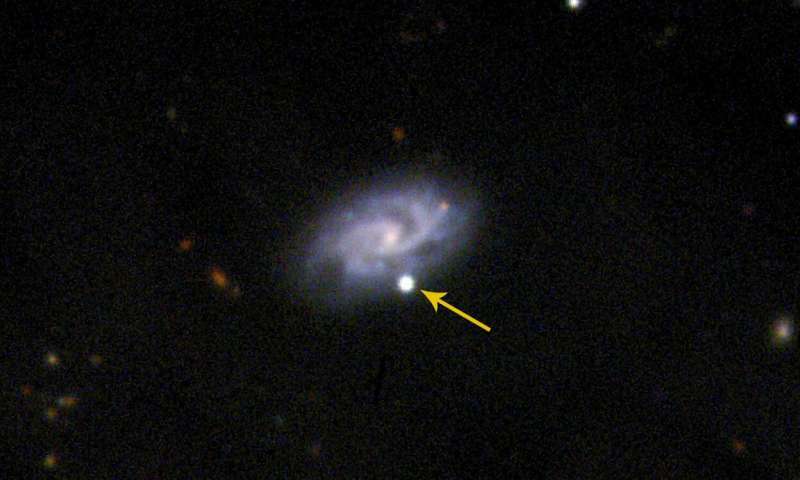 Until now, astronomers have been unable to study the earliest moments in the development of a supernova of this kind (a GRB-SN), but SN2017iuk was fortuitously close-by—at roughly 500 million light years from Earth—and the GRB light was underluminous, allowing the SN itself to be detectable at early times. Dr. Rhaana Starling, Associate Professor in the University of Leicester's Department of Physics and Astronomy said: "This immediately looked like an event worth chasing, as it happened in a grand-design spiral galaxy at very close proximity, cosmologically speaking. "When the first sets of data came in there was an unusual component to the light that looked very blue, prompting a monitoring campaign to see if we could determine its origin by following the evolution and taking detailed spectra. "The gamma-ray burst itself looked quite weak, so we could see other processes that were going on around the newly-formed jet which are normally drowned out. The idea of a cocoon of thermalised gas created by the relativistic jet as it drills out of the star had been proposed and implied in other cases, but here was the evidence that we needed to pin down the existence of such a structure." A coordinated approach using a suite of space- and ground-based observatories was required to monitor the supernova over 30 days and at many wavelengths. The event was first detected using the Neil Gehrels Swift Observatory. Swift is a NASA space mission in which the University of Leicester is one of three partners, and hosts its UK data centre. Data obtained with the Gravitational-wave Optical Transient Observatory (GOTO) helped to track the supernova light, while spectroscopy was obtained through dedicated observing programmes including initiatives by the STARGATE Collaboration headed up by Professor Nial Tanvir at the University of Leicester, which uses 8-m telescopes at the European Southern Observatory. Professor Tanvir, Lecturer in Physics and Astronomy at the University of Leicester said: "The relativistic jet punches out through the star as if it was a bullet being fired out from the inside of an apple. What we've seen for the first time is all the apply debris that explodes out after the bullet." Speeds of up to 115,000 kilometres per second were measured for the expanding supernova for approximately one hour after its onset. A different chemical composition was found for the early expanding supernova when compared with the more iron-rich later ejecta. The team concluded that just hours after the onset the ejecta is coming from the interior, from a hot cocoon created by the jet. Existing supernova production models proved insufficient to account for the large amount of high velocity material measured. The team developed new models which incorporated the cocoon component and found these were an excellent match. SN2017iuk also provides a long-sought link between the supernova that accompany GRBs, and those that do not: in lone supernovae, high speed outflows have also been seen, with velocities reaching 50,000 kilometres per second, which can originate in the same cocoon scenario but escape of the relativistic GRB jet is somehow thwarted. 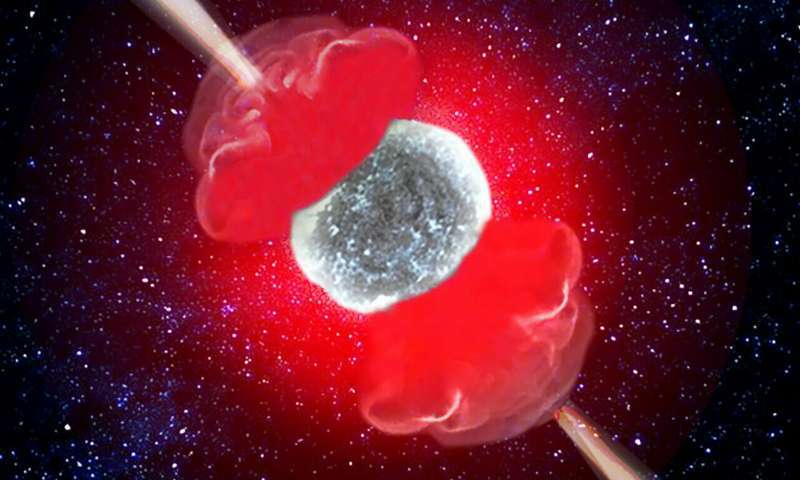 Core-collapse supernovae without GRBs are usually found much later after their onset, giving scientists very little chance of detecting any signatures of a hot cocoon, whilst cocoon features in GRB-associated supernovae are usually hidden by the bright, relativistic jet. The rare case of SN2017iuk has opened a window onto the earliest stages of this type of supernova phenomenon, allowing the elusive cocoon structure to be observed. yes granny, a fascinating dream. & your proof as to the lack of gravity? Or the quantity of Mass Attractant it would take to hold in place such a pitiful result of minor forces as plasma? "force"? Where do you get "force" from? The correct term is "acceleration". Those magical plasma rings of yours would spray away like a rotating lawn water sprinkler. You got too stop reading comicbooks for your scientific knowledge. There ain't no such thing or "force" as artificial gravity. granny, you can climb up into your ancestral tree. Wave your magic stick at the sky. & screech your woomongering dictates at the universe. The Cosmos just totally ignores your infantile rants. And the first-year journalism students pork the pooch again. "A very powerful phenomena" would be "a very powerful phenomenon" in English. Which is pitiful considering this was published by an English university. Maybe they should be taught English before they're turned loose on science articles. Yep. Not great. I get continually peed off by people that can't differentiate between their, there & they're. And could of and would of, instead of could've, would've. Etc. Drives me mad. "Your an idiot" is my favorite. Unfortuitously, eye keap baking dose terrors alt da thyme!